This is a very clear exposition of the research. As I recall this information was already in the paper and supplementary material but it’s really nice to have it summarised here so clearly. [Response: No one would make such a mistake when, er., presenting “science” to the state legislature of Washington, would they? ;). (Link). The format of this response (brief summary plus FAQ addressing questions and criticisms) is especially helpful, very effective. I think this paper represents a very nice advance in the characterization of Holocene climate; ever since the various papers on cooling trends of the past 2000 years pre-industrial started coming out, I had been yearning for something that covered back to the Altithermal. This kind of paper will be very valuable in refining our understanding of how the climate responds to the precessional cycle, particularly once it becomes clearer whether the reconstructed temperatures are really annual averages, as opposed to biased toward summer. I do think, however, that some of the commentary in the blogosphere regarding how unprecedented the warming of the past century looks (notably the “wheel chair” graph comparing Marcott et al with the instrumental record) risks going beyond what can really be concluded from the study. As noted in the FAQ, the time resolution of reconstruction is approximately a century. Thus, it is not quite fair to compare the reconstruction to instrumental data that is not smoothed to the same time resolution. It is conceivable that there are individual centuries in the Altithermal where the temperature rose as fast as today, and to the same extent or more, but these would not show up in a record smoothed to 100 year time resolution. I think this is very unlikely, but the paper doesn’t strictly rule out the possibility. This remark applies only to the warming of the past 100 years. Where we are going in the next century is so extreme it would show up even if smoothed down to the centennial resolution, I think. Note also the response in the FAQ concerning Fig. 3, where the authors attempt to back out some information regarding possible high frequency Holocene variability that is damped by the smoothing. I would welcome further discussion regarding the nature and validity of those arguments. Is the response to criticisms about core-top dating adjustments clear enough to end that particular dispute? The radio-carbon dating calibrations were not at issue. a) There needs to be plausible mechanisms for both an upspike like the current, and then a downspike of approximately similar size. b) Any such mechanism must not be caught by higher-resolutiuon proxies like ice-cores. So the question is: how well can possible jiggles be bounded? I note that the usual line+uncertainty zone graphs do not constrain possible paths as much as physics and other data do. It seems fairly hard for the real line to be at the bottom of the zone at one point, leap to the top at the next, and then go back … unless someone can provide a real mechanism. Anyone so inclined may pile on over at DotEarth. I hope I have not inserted my foot too far into my mouth there; it’s usually at a level that does not exceed my abilities. Step 9 in the stacking procedure describes the proxies being ‘mean-shifted’ to reference them to the 1961-1990 CE mean. Is this saying the various proxies are providing relative temperature estimates, and those need to be tied into an external source (like an overlap with the instrument record at their ends) to make them absolute? Or is this simply describing how they locate “0 C” on the y-axis in the figures? The post which Eric links to is the final installment of a three-part series on the Marcott et al. reconstruction. It deals primarily with the regional differences revealed by the proxies. The issue of the 20th-century uptick is the main topic of part 2. What the “critics” are desperately trying to ignore is the real point of this work, the subject of part 1 of the series, namely the big picture of temperature change throughout the holocene. The point of Marcott et al. is to study global temperature change in the past, not the present — specifically the last 11,300 years. In fact, for this reconstruction the number of proxies used dwindles as time goes forward, rather than dwindling as one goes back further in the past like in most other paleo reconstructions. One hardly needs Marcott et al. to tell us about recent global temperature changes; we already know what happened in the 20th century. For the given purpose, re-calibrating the proxy dates is absolutely the right thing to do. What happened in the past is most definitely not like what happened in the 20th century. In spite of the low time resolution of the Marcott et al. reconstruction, the variations (even — perhaps especially — without the smoothing induced by the Monte Carlo procedure) are just not big enough to permit change like we’ve seen recently to be believable. In my opinion, the Marcott et al. reconstruction absolutely rules out any global temperature increase or decrease of similar magnitude with the rapidity we’ve witnessed over the last 100 years. And the fact is, we already know what happened in the 20th century. Critics of the recent uptick, and of the re-dating procedure, either have utterly missed the point, or they staunchly refuse to see it and want everyone else not to see it either. Their foolishness is appalling. Without the uptick there is no basis for the headline. Tamino, after all these years, surely you no longer expect honesty in either fact or tactics from the denial industry? The point is to find something to criticize and go to town on it. This one is easy for them, all they have to do is separate the parts of the record and go after the level of certainty of each part, then indicate that until they are all perfectly linked by methodology and accuracy, it’s all a tissue of loosely sewn lies. Many innocent worker bees will spread the “word”, not necessarily even knowing they are being used. Andy Revkin, IMO, values his reputation for fair mindedness and I’m guessing he also has difficulty swallowing the level of danger we face and grasps at straws. All those “honest brokers” – gag. Speaking of lies, Steve, the one man rapid response squad, has a pack of them up as a comment on this piece. Sometimes I think he is being deliberately obstuse. Re #11. Can you be specific? Steve’s post doesn’t have anything untruthful. Here are a few unanswered questions posed by Steve McIntyre. Or the deletion of modern values from OCE326-GGC300. Nor do they discuss the difference between the results that had (presumably) been in the submission to Nature (preserved as a chapter in Marcott’s thesis). Nor did they discuss the implausibility of their coretop redating of MD95-2043 and MD95-2011. Perhaps Marcott et al can provide the answers. Rattus, you too are underestimating the intent and intensity of the response. When the article first appeared in multiple locations (DE version below), the denialbots were caught off base, but they’ve been going to town ever since. I watched it flower and grow, which is why I was prepared for this round at DE. Curry has also been busy. Time for you guys to return to science, though, sorry for the interruption. re: 3 Raypierre and 5 Eric: thanks. I’d seen tamino’s nice post, but I still haven’t seen a good analysis of possible forcing changes and causes to raise the temperature equivalent to the modern rise, and then nullify enough of it to escape notice by the higher-resolution proxies. I understand that spikes are not ruled out by the statistics of the proxy-resolution they used, but I’m trying to understand a combination of events that could produce such a spike. The thought experiment would be: take the modern rise, place that anywhere on the Marcott, et al curve, with start at the lower uncertainty edge, and propose a model for what could have caused an upspike, and then enough of a downspike to get back to the line in a way that doesn’t contradict the ice-core records. 1) Major state change gyrations like Younger Dryas (before this) or the 8.2ky event … but they show strongly in ice-core CH4 2 records, and seems like it would be very noticeable in a set of marine records. And we certainly know that isn’t what’s happening now, i.e., the upswing at end of YD. 2) A strong volcanic period, followed by a period with none. 3) A BIG boost in solar insolation. 4) A big rise in CO2 … but the ice cores rule that out. Anyway, the question remains: what combination of events could cause a current-equivalent spike and escape the higher-frequency proxies? How is this anything other than an arbitrary shift, and as such how can this be regarded as a robust conclusion, that would support the press release? Re 17, Eric, This is a problem because by choosing different reconstructions and/or time intervals you can shift the baseline almost as you wish! Gavin, saw you the other night with Stossel. You represented yourself well. I think you have the integrity to enable a true scientific discussion, reminiscent of the one a couple of years ago at ourchangingclimate.org with the statistician VS. Let McIntyre go mano-to-mano with Marcott. Science will be better for it. Thanks Gavin/Eric. Look forward to Marcott’s expanded response. Gavin,thanks for your reply. I realize you are not their keeper, but you do realize you occupy a pivotal role in the world debate. I would urge you, despite your protestations that this will turn into a cage match on the minutia of this particular study, to encourage the two to go at it. Trust me, it WILL be good for science. that cover this interval (Fig. 1G), this difference is probably not robust. It does seem to me that somebody’s reading commprehension may be a little off and may not have the first clue on what they are critisizing. I wonder if any press agents will demand a response from McI on that one. (1) Temperature changes such as postulated in a spike require some physics, not just arm-waving about “it might be possible”. Just because a method has a particular lower resolution limit does not make gremlins in the gaps a likely postulate. (2) Finer resolution proxies such as ice cores should have picked up such temperature changes in isotope ratios or in CO2 concentrations driven by ocean temperatures. (3) Most important of all – even if such a spike occurred (doubtful based on energy conservation), it would not be relevant to recent temperature changes – because although temperatures are rising at a geologically fantastic rate, it will take a minimum of thousands of years to return to previous temperatures due to the concentration lifespan of CO2. Meaning that an event like the current warming would inevitably have been seen in the Marcott data. So arguing about possible but unlikely spikes and returns during the Holocene is irrelevant to the situation we find ourselves in today. Shakun, J. D., P. U. Clark, F. He, S. A. Marcott, A. C. Mix, Z. Y. Liu, B. Otto-Bliesner, A. Schmittner, and E. Bard (2012), Global warming preceded by increasing carbon dioxide concentrations during the last deglaciation, Nature, 484(7392), 49, doi:10.1038/nature10915. Why the change in methodology between the two papers? Since the 2 papers are closely related do you not think it would have been a good idea to explain why the core top dating method was changed? What impact would using the core top dating method used in Shakun et al (2012) have on Marcott et al (2013)? What impact would using the core top dating method used in Marcott et al (2013) have on Shakun et al (2012)? Since the Shakun et al (2012) and Marcott et al (2013) share the same analytical code (the Shakun et al SI states the analytical code will be published in Marcott et al) can you show the figures that you got when you used the Shakun et al (2012) core top dating method? No temperature spike lasting ca. 100 years is present in the far south. I agree that science is ill suited to “cage matches”. I also apologize for beginning to go over the edge in characterization. I’ve been under more or less continuous attack for years because of my views that science as it is practiced is worthy of respect and should be taken at face value. I find these attacks disingenuous, and they are full of personal innuendo. However, it must be remembered that when, as in my particular case, we give up our self-respect and react, we demean the basic premise that truth is at the center of all scientific investigation. I’ve been reminded several times recently that my voice has its greatest value when I stay away from the personal fringes and don’t react. It may be hard, but it is necessary. Eric, This is a problem because by choosing different reconstructions and/or time intervals you can shift the baseline almost as you wish! How is this “not so” in the category of “being able to set the baseline to any reconstruction you wish”? From what you’re saying, it seems instead that you can set it to others, but the paper isn’t supposed to speak to whether or not (for example) the MWP is warmer than present (a popular reference-point for any reconstruction). But instead, all Marcott et al needs to do is to show similar enough alignment of warming and cooling periods within the reconstruction dates (nevermind the magnitude) in order to be deemed ‘consistent’. Do I have this right? This means that Marcott et al can also be ‘consistent’ with any of the others, including something like Loehle et al, because all we need to see is the similar mimicking of ups and downs (more slopes than magnitudes) through AD 0-1850…and then what we already know of 1850-present becomes another implied conclusion of the paper (meaning the specific reconstruction doesn’t itself speak to it, but taking the known instrumental record along with it you have a dramatic shift upward in temperature). If I have this right, this means that Marcott et al can still be correct and informative even if the WMP was warmer than present (which can be achieved by re-aligning the proxy mean to a different reconstruction, the defense of which then becomes a necessary component to the paper). Are you saying that published peer reviewed science papers have levels of certainty that are imperfectly linked by methodology and accuracy. As I understand it, without the core-top re-dating, the proxy reconstruction takes a rather steep dive in the 20th century. [Response: The error bars on the reconstruction once age uncertainties and proxy drop out are taken into account are large – and so many of the Monte Carlo members in the stack go up, but many go down. After re-dating there is a sharp rise, the opposite. If the whole reconstruction is done without the core-top re-dating it appears that the 20th century is “cooler” than a large part of the Holocene (looking at proxies only). If there were issues with the most recent proxies, why weren’t they truncated instead of specifically re-dated [edit – no assumption of motive please]? Why were the original dates not acceptable? Also, with original dating in the reconstruction there is a significant divergence with the 20th century instrumental record. I don’t understand how the reconstruction in total is “robust” with regards to the proxies ability to represent temperature to the resolution that makes any analysis of recent years possible. I see nothing in the FAQ that addresses the authors reasons for the re-dating of core-tops or how they can apply their re-construction to any recent warming, a very small time frame. How does this reconcile with the following excerpt from the abstract? Based on comparison of the instrumental record of global temperature change with the distribution of Holocene global average temperatures from our paleo-reconstruction, we find that the decade 2000-2009 has probably not exceeded the warmest temperatures of the early Holocene, but is warmer than ~75% of all temperatures during the Holocene. Now that DotEarth comments from the day are being rolled out it looks like a concerted negative campaign. As to “cage fighting” this would be a perfect example of why it wouldn’t work. A plasterer, I’m saying that the effort to discredit science is fond of claiming that nothing short of perfection is acceptable. The point is that we will never have consistent temperature records over centuries and millenia. This is a ready-made to deceive the gullible. Sorry Susan,dont want to appear gullible but I don’t understand you. I thought for science to be ‘perfect’ it would have to be correct.Are you saying it is not correct?Wether or not it is ‘acceptable’ is beside the point,it is either correct or not correct and if we will never have consistent temperature records over centuries and millenia,why are we trying to predict future temperatures from them.? I know they are uncertain, the question is why they re-dated previously published core tops. They only re-dated (not re-calibrated) several and have not addressed it in the FAQ. If they are uncertain etc., how are the authors dates more valid than the published dates? The affect of this is a later issue in the chain. I understand instrumental records are more accurate than some sediment but how can you compare so vastly different resolutions with any certainty spanning the entire Holocene? 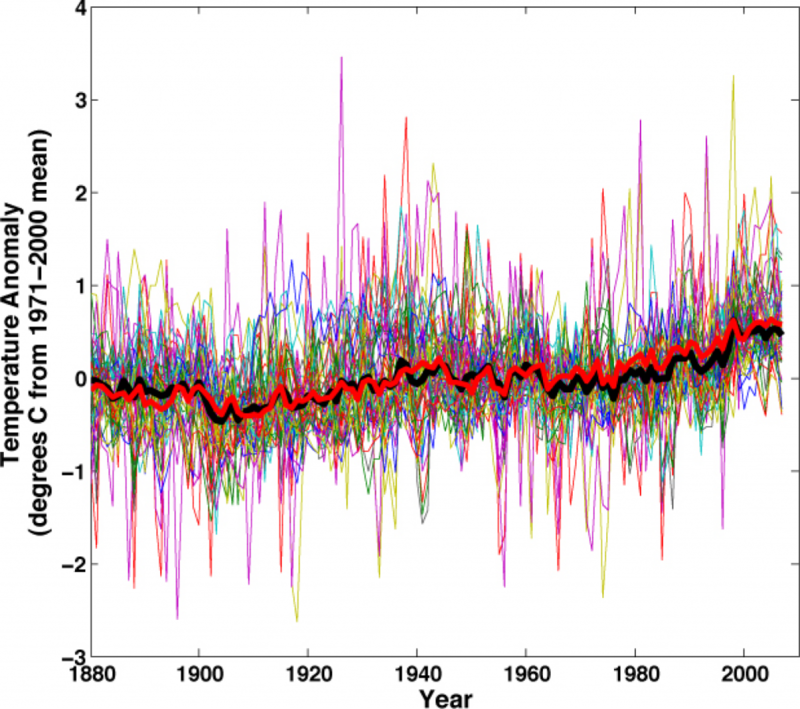 Tenths of a degree decadal? Thank you for the link to Tamino, I am going through the post now. I know you can’t speak for the authors, I just don’t understand where the Qs in the FAQs came from. I’m just a guy who has to pay for this stuff. So when the NYT trumpets the following, asking the world to spend trillions more on “green” energy, sans nuclear, what am I supposed to think? While I hope for humanity, you guys have it wrong, I hope for science you have it right. I can’t imagine the backlash to all this expense if you are wrong. A Plasterer: What exactly do you mean by ‘correct’? In most data collected in science, there is some degree of uncertainty as regards how close it is to the ‘true’ data (chemical formulas are the only exception I can think of). Much of science consists of finding new ways to get closer to the ‘true” values, while a large part of statistics is aimed at determining the probable lower and upper bounds within which the ‘true’ value lies. For most data, exactly correct values are not known and likely will never be known. The important thing is,’are the data good enough to be useful?’ For climate science, physical and historical data are known with much more precision than is needed to be able to predict rapidly increasing global temperatures. How much was it shifted? @ 23 Thank you very much. Ditto, everyone at every level of the discussion and in every capacity. There’s a new standard being set here–and taken higher. Thank you all for your contributions. I think he means you are paid by the taxpayer. The Marcott et al reconstruction has been widely reported as confirming other “hockey stick” reconstructions such as Mann 2008. Would it not be more accurate to say the study supports other hockey stick handles but is silent on the blade? Why was this portion included initially and why did the paper’s authors draw attention to it in the NSF press release and in many interviews? Would the authors care to comment upon why this non-significant uptick was absent from Marcott’s thesis that this paper was based upon? Thanks for this post. A nice summary indeed. However, Marcott et al. (like many other papers, including MBH ’98, back in the day) presents clear internal evidence (in the form of inordinate amounts of time and effort expended) that yes, some folks really do care what the temperatures in the early Holocene (or the the early modern era) were–regardless of what that may or may not say about our present predicament. c) they believe we are still stuck in the Little Ice Age (eg Pielke diatribe). I marvel at all the achievements that allowed this research and other work like it to come to fruition. The effort that must have gone into the collecting proxy samples by so many people over so many years (in some cases the work quite probably entailed personal danger). The painstaking measurements and analysis. Not to mention all the previous research that identified what proxies to collect in the first place and how they can be used to indicate past temperatures and other things, development of tests etc. Then came the idea for this work and the further analysis by Shaun Marcott, Jeremy Shakun et al. Clever and dedicated people have been quietly working to build up a vast amounts of knowledge in only a few decades. They deserve congratulations and recognition. It’s only the illiterati who scoff at and belittle such achievements instead of making the effort to understand and learn from them. This small but loud group are not deserving of any respect at all IMO. During the past three weeks, I have watched for complaints by the original authors about redating the published cores. Since no-one has spoken I concluded that the original researchers have no problem with this procedure. Now we see that Richard Telford notified Marcott et al about redating after original publication. I this particular case, Marcott et al did not redate a core: they simply used the best information available. In honest discussion, the redating complaints should end. I still don’t understand why the uptick is included if it is “not robust”. Surely the authors, editors, and reviewers are aware of the publicity and scrutiny that studies on this topic receive. News articles and bloggers aren’t all going to care about qualifying discussions in the paper nor will they ensure conclusions they draw are consistent with the authors’. I understand that the authors had to draw the line somewhere but to not question the inclusion of the uptick and then later wonder why it is being picked on seems disingenuous (or obtuse;)). I think RC would come off as a bit less partisan if they would note honestly in Revkin’s dialogue with Shakun, Shakun was every bit euphoric about the uptick. To pretend that the uptick was never of any consequence is to dissemble. If the authors were clear that they were comparing the recent measured temperature record against their proxies, then your statement would be valid. Is this what you are asserting? It is certainly a valid interpretation that the authors were comparing *** their own *** last century proxy results against the past millennium, which they now declare as not robust. Inquiring why the authors made these statements, without qualification, is a legitimate question. Since Marcott et al ends in 1950 and the IPCC has concluded the temperature increases pre 1950 are due to natural causes, Macrott cannot be showing us anything about the human influences on temperature. Rather, it must be concluded that what Marcott is showing is only the natural variability in temperature and if any weight is to be given to the uptick, it shows that at higher resolutions there may be significant temperature spikes due to natural causes. NOAA shows the 8.2kyr event as greater than 3.0C, while GISS shows the 20th Century rise as less that 0.7C. 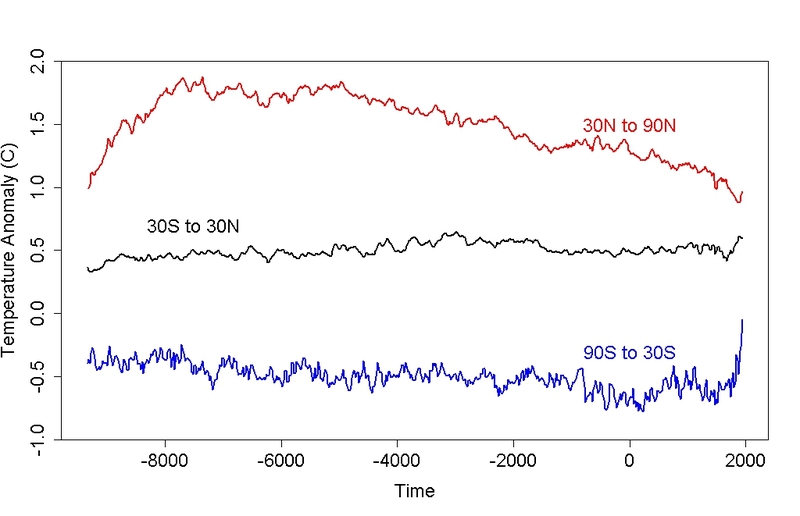 “Near-simultaneous changes in ice-core paleoclimatic indicators of local, regional, and more-widespread climate conditions demonstrate that much of the Earth experienced abrupt climate changes synchronous with Greenland within thirty years or less. Post-Younger Dryas changes have not duplicated the size, extent and rapidity of these paleoclimatic changes”. I went back to the Skype call. Shakun was engaged and animated; I couldn’t see any euphoria. I did however think he would be a good guy to drink beer with. Revkin wanted to talk about the 20C so Shakun did. He was , however, always careful to make the distinction between the paper and the instrumental record. In this , he was consistent with the paper and the FAQ’s. that some want to hold Marcott et al responsible for what others write about the paper or the headlines that others compose does seem a bit silly.